Einstein's attitude to quantum theory is often portrayed as that of a reactionary, wanting a return to the ways of classical physics. 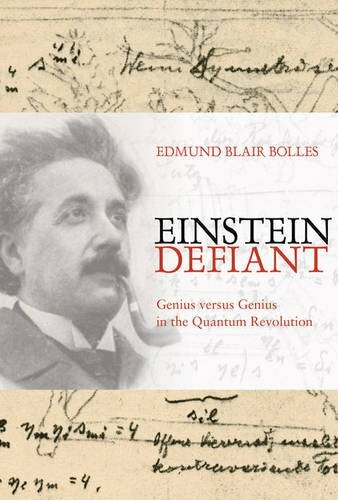 In 'Einstein Defiant' we are told a different story - in the early 1920's it was Einstein himself who was in the forefront of the development of quantum theory. Although 'Einstien Defiant' is entirely non-technical, Bolles does a very good job in describing the development of physics during revolutionary times. We find out how Einstein was promoting the idea of the photon to explain electromagnetism, while Niels Bohr was looking for explanations based on the more classical, wave theory of light, although Bohr was willing to consider the revolutionary step of abandoning the principle of conservation of energy. This battle was decided in Einstein's favour, with the discovery of Compton scattering, which needed the photon theory to explain it. Einstein was also involved in highlighting the important work of several researchers such as de Broglie and Bose, whose efforts might otherwise have been ignored by the scientific community. Berlin after the First World War was a strange mix of defeatism and optimism. There was political unrest, rampant inflation and German scientists were often shunned by the international community, but somehow this didn't prevent scientist there from coming up with spectacular new discoveries. However, the book isn't just about the science, it also looks into the daily lives of Einstein and his contemporaries in these turbulent times. At the start Einstein was influential enough to help secure the release of a number of professors being held by revolutionary students, but as time went on anti-semitism became an increasing problem. This didn't just mean crackpot attacks on relativity - for a while his life was in danger from extremists and he had to lie low until the situation improved. Of course in the end the Nazi party came to power and Einstein left Germany permanently. My one criticism of the book would be the start of the second part, where the sequence gets very confused. The story has got as far as events of 1924. However, there are then flashbacks to Einstein's work on general relativity a decade before, interleaved with a tram journey he made with Bohr in 1922 on the way back from the Nobel prize ceremony. Bolles doesn't go into the same detail as with the main part of the book - for instance he doesn't mention David Hilbert's competing work on the subject. Also the description of General Relativity was rather muddled and it's hard to see why this section was included at all - I felt that it didn't add anything to the work. The third part of the book looks at the rise of the new quantum theory based on the work of Born and Heisenberg. This was adopted enthusiastically by Bohr, but Einstein felt that its probabilistic nature and its denial of realism were unacceptable. Some physicists, such as Schrödinger, sided with Einstein, but Bohr's opposing view gradually became dominant. Einstein continued to press his point of view, in particular at the Solvay conferences of 1927 and 1930, but he was fighting a losing battle. Personally I feel that Einstein's view had a lot going for it, and it is interesting to read about how it became rejected from the mainstream of physics. The book starts at the end of the First World War, and continues until the beginning of the 1930's and so covers what might be considered to be the peak of Einstein's career. He became a worldwide celebrity when Eddington's solar eclipse expedition in 1919 confirmed General Relativity's prediction of the gravitational bending of starlight. By the end of the 1920's his influence in physics began to decline, although his status with the public was as high as ever - a department store even posted details of his latest theories in its windows! All in all Bolles new book tells a fascinating tale of a critical time in the development of physics and I would recommend it to all readers interested in the history of physics in the 20th century and more generally to anyone interested in the history of Europe between the wars.